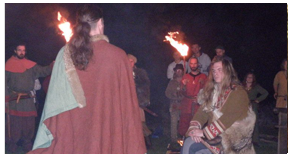 In September 2013, the East Storm Commander, Igor Gorewicz, moored on English land to conduct a very special ceremony. Magnus Rus Ulfson, spiritual son of Ulf Eirik, carrier of the flame of honor and chief of the Wolf pack, was to be sworn in on that day. After much political strife and struggle with friends turned foes, Magnus Rus managed, with the support of his brothers, to emerge from the darkness and rise into the light. After a year of hardship and dedication, Magnus managed to surround himself with true friends and brothers and acquire their loyalty. Once the wolf pack was gathered, it had to be born, and by the mean of a formal ceremony, the Lord of the East summoned the Norse and Slavic Gods to attend the official birth of the Ulflag. Some months later, the warriors deemed worthy of entering the Ulflag and the brotherhood of Jomsborg, were to take their oath and swear to their Styrsman, East Storm and Brotherhood. The ceremony was conducted at a sacred place, where the spirits of old are strong and the Gods can weave their seidr undisturbed. By taking the oath, each warrior was to become a wolf brother to the other, swearing on their weapons and honor.